A series of seven symposia/conferences will be held under the name of “EVOLINGUISTICS 2018”, our first large-scale international sympoia. For details (abstracts), please see the symposia website . A workshop titled above will take place at ALIFE 2018 (THE 2018 CONFERENCE ON ARTIFICIAL LIFE), which is in partnership with us Evolinguistics Project. Many of the C01 members will give a talk at the workshop. We will have the workshop on evolution of genomes, languages and music. 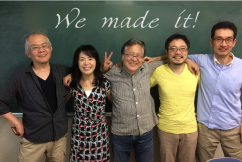 This program is financially aided by URPP Evolution in Action, University of Zurich & “Evolinguistics” MEXT Grand-in-Aid for Scientific Research on Innovative Areas, Japan. It aims to clarify the evolution of languages/music and similarities/differences from biological evolution through quantitative datasets. We provide three sessions presenting 1. dispersals of language (and music) relating to migration histories from genetics side, 2. linguistic and musicological studies, and 3. theoretical modelings of cultural and linguistic evolution. Then, we will have a discussion about what we can learn about the evolution of languages and music through the different types of the datasets in the final session. Organizers: Hiromi Matsumae(Tokai University) & Kentaro Shimizu (University of Zurich/Yokohama City University). ※Please replace ★ with @ in the email address above. Understanding the neural mechanisms underlying behavior presents a formidable challenge requiring a well-chosen model system and sophisticated experimental tools. Vocalizations of the African clawed frog (Xenopus laevis) are an exceptionally well suited model system for this objective. In this species, a simplified mechanism of vocal production allows straightforward interpretations of neuronal activity with respect to behavior, and neural mechanisms of calling can be studied in vitro because fictive vocalizations can be elicited in the isolated brain. Furthermore, the vocalizations of Xenopus are sexually differentiated, and rapid androgen-induced masculinization of female vocalizations provides an invaluable opportunity for determining how new behavior arises from existing neural circuits in response to steroid hormones. In my talk, I will discuss how the vocal central pattern generators (CPG) are constructed, and an unexpected discovery of feedback pathways within the CPG that play a critical role in the rhythm generation. In addition, I will describe our work developing a technique to deliver transgenes into the frog nervous system. ※This is a closed meeting for project members only. Teleost fish comprise the largest group of extant vertebrates displaying the greatest diversity in sound producing apparatus and sensory hearing structures for social communication and orientation. Neural circuitry controlling vocal behaviour in vertebrates seems to have evolved from conserved brain areas found in ancestral fish before they diverged into the major clades. Thus, studies that investigate acoustic communication systems in this taxon are important to gain a comprehensive understanding of the fundamental mechanisms underlying social acoustic communication. Moreover, studying organisms from an early diverging vertebrate lineage such as fish is essential to comprehend the evolution and function of the vertebrate inner ear, since many early developmental events are evolutionary conserved. In this talk I will focus on the social role and physiological mechanisms controlling acoustic communication in toadfishes (Batrachoididae). I will further discuss current research on auditory plasticity and development of auditory function using both models – toadfish and zebrafish (Danio rerio, Cyprinidae). No entry fee, no registration required. Food and drink not allowed. Following the announcement that our grant proposal was accepted, we held the first management team meeting on July 7th, 2017. We reconfirmed the purpose and method, formulated research plans based on the allocated budget, and confirmed our future policies.